Detail from OSD 267 pt.1 (Oakham, Boyce), detail showing Burley Park. bl.uk > Online Gallery Home	> Online exhibitions	> Ordnance Survey drawings	> Detail from OSD 267 pt.1 (Oakham, Boyce), detail showing Burley Park. From the mid-18th century, the landscape and economy of England were dramatically transformed by the increasing number of Enclosures Acts. These private acts of parliament allowed land owners to fence open land that had previously been freely available for the community to graze livestock and glean food. Two Acts of Enclosure had been passed in time of Queen Anne at the start of the 18th century; during the reign of George III, the number rose to 1,532, enclosing almost three million acres of land. 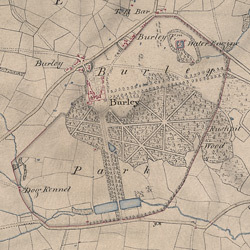 Enclosures gave rise to the fenced private country estate, such as Burley Park, shown in this detail from the 1814 Ordnance Survey fair plan of the Oakham district. The boundary of the park is shown in red, indicating that it was enclosed by brick or stone walling. The boundary passes through Rushpit Wood, which had previously been open to all. Inside the wall, the wood has been 'improved', that is, altered by a landscape designer to confirm to fashionable ideas of the picturesque. Burley Park's combination of woodland paths, lakes and tree-lined avenues is typical of 18th-century garden design. The water engine noted at the top of the estate would have powered a cascade or fountain. Another effect of the land enclosures is hinted at by the dog kennel shown at the bottom of Burley Park. The thick hedges planted to enclose farmland proved an ideal habitat for foxes, while the fencing of woodlands and commons discouraged deer, the traditional quarry of aristocratic huntsmen. As a result, hunters turned their attentions to the rising fox population. Hugo Meynell was the first to breed dogs that had the speed and stamina needed for fox hunting. By 1750, there were fifty foxhound kennels on English country estates.